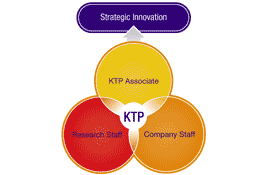 Have you ever wondered what a KTP is, how it works and how you could get involved? Then wonder no more! Dr Martyn Polkinghorne demystifies the elusive KTPs! Knowledge Transfer Partnerships (KTP) are partly Government funded and aim to help businesses absorb and benefit from the knowledge/expertise residing within UK Universities and Colleges. 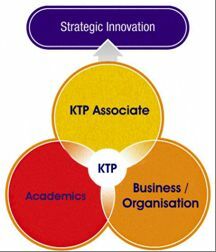 The rationale behind each KTP is the formation of a 3-way partnership between a ‘Business’ partner, a ‘Knowledge’ partner and a ‘Graduate’ partner that leads to genuine and sustainable benefits for all involved. BU has undertaken Knowledge Transfer Partnerships (including the previous Teaching Company Scheme) for 22 years during which time we have run approximately 90 projects that have brought in over £9 million of enterprise income. When funding is agreed, a Graduate is employed by the University, but based full-time at the organisation to deliver the project. Approx. 1/2 day of specialist academic effort is provided to support the project and drive it forward. Although normally with a business partner, KTPs can sometimes also be run with social enterprises and public sector bodies. The project budget pays for the Graduate, the Academic support and related training, travel and equipment. Even with the Government’s funding KTP is not a cheap solution, but for the right project it can provide the external partner with excellent value for money. The major sponsor of KTP remains the Technology Strategy Board (TSB) which funds approx 50% of all projects. Both the TSB, and the other minor sponsors (Research Councils, Regional Development Agencies, Government Departments, ERDF etc) have strict priorities for the project sectors and organisational types that they wish to support. Potential projects must address the funding criteria of one of the sponsors and be able to demonstrate high levels of innovation, impact and challenge. Recently completed KTPs include a fantastic project with Cholderton Rare Breeds Farm Park in which Steven Richards from the School of Tourism helped the company to develop and implement a new marketing strategy which increased visitor numbers to the tourist attraction, and helped to safeguard the future of the organisation. Further examples of KTP case studies can be accessed here. If you want to find out more about KTPs or discuss an idea for a potential KTP then contact Martyn Polkinghorne. Further information can be found on the BU KTP webpages or the national KTP website.